Andrew McIlwraith was born on 11th July 1844 in Ayr, Scotland. He was the fourth son of John McIlwraith, a successful plumber and ship owner, and his wife Janet. 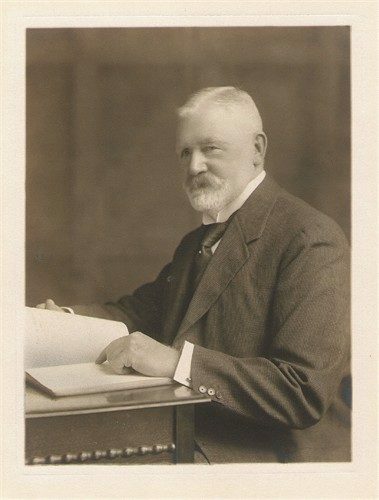 He was educated at Ayr Academy and joined his father’s business in 1868, supervising the family’s small shipping fleet and working on the development of close commercial relationships with his brothers, both of whom were enjoying considerable success in Australia. On 1st February 1875 Andrew founded ‘The Scottish Line’ with business partner Malcolm MacEacharn, registering themselves as ‘shipping and insurance agents’. Within 3 years they had built a fleet of 5 ships, initially thanks to an agreement with the State of Queensland to carry migrants from British shores. Soon they were also exporting wool and other primary produce not just to Australia but also to the US and South America. Their handsome clippers were fast ships; the Scottish Wizard was renowned for completing the Bristol to Melbourne route in 92 days. Andrew’s eldest brother John (1828-1902) had emigrated to Victoria in 1853 where he established a thriving metal works business in Melbourne, manufacturing block tin tubes with imported hydraulic equipment which he supplied to the booming plumbing trade and the developing gas works industry. His contracts included the pipework to provide hot water at Melbourne Hospital. Lured to Australia by John’s success, brother Thomas McIlwraith (1835-1900) migrated to Victoria the following year, 1854, and began a career as a railway engineer and surveyor, later developing significant sheep stations and cattle runs. Entering into politics, he was known for his considerable physical stature, his heavy drinking and his passion for massive railway building programmes. By the time Andrew visited his brothers in 1875, Thomas was serving as Premier of Queensland. Thomas was evidently a very colourful character, indeed a biographer notes that “he did not emerge blameless from the three largest financial scandals in Queensland history”. When Andrew McIlwraith was awarded a royal commission in 1880 the brothers were investigated for corrupt dealing of contracts: the charges were dropped. In 1879 the Scottish Line chartered the steamer Strathleven and fitted her with a Bell-Coleman mechanical refrigeration plant. Collaborating with both of his brothers on this project, (John was his registered shipping agent in Melbourne and Thomas provided the produce and possibly some funding) the Strathleven returned triumphant from her maiden voyage to Australia with 30 tonnes of perfectly frozen beef and 2 tonnes of butter. Refrigerated shipping was born. McIlwraith MacEacharn rapidly expanded their fleet and expertise and enjoyed immense success with imposing offices in London, Newcastle, Sydney, Adelaide, Perth and Freemantle. Andrew lived for many years in his Hertfordshire home ‘Campbellfield’ in St Albans, (the property has since been demolished) and retired to Salcombe in 1913, living at Woodcot on Cliff Road. His benevolence towards the people of his seaside retirement home is the stuff of legends. He bequeathed into Trust not just Cliff House but also a number of other properties, woods, gardens and tracts of land. This has protected sections of Salcombe from development and ensured that prime stretches of waterfront and some of the best views of the estuary remain to this day for the enjoyment of us all. Andrew McIlwraith was a handsome, red-bearded man with an outgoing and convivial personality. He had friends in high places including Brunel, Paxton and Andrew Fisher, a fellow Scot and Australian Prime Minister for the Labour party. His family life was not perhaps as rosy as his professional career. His first marriage to Mabel Stephenson (in November 1871) ended in separation and his second (in 1895 to American Holte Leichenburg) also failed. He lost two sons in the South Africa War and his third also predeceased him. He was survived by three daughters, two from his first marriage and the other from his second. He died on 19th October 1932 and is buried at Shadycombe Cemetery, Salcombe. D. B. Waterson, 'McIlwraith, Andrew (1844–1932)', Australian Dictionary of Biography, National Centre of Biography, Australian National University, http://adb.anu.edu.au/biography/mcilwraith-andrew-7370/text12805, published first in hardcopy 1986, accessed online 15 January 2019. J. Ann Hone, 'McIlwraith, John (1828–1902)', Australian Dictionary of Biography, National Centre of Biography, Australian National University, http://adb.anu.edu.au/biography/mcilwraith-john-4098/text6547, published first in hardcopy 1974, accessed online 15 January 2019. Don Dignan, 'McIlwraith, Sir Thomas (1835–1900)', Australian Dictionary of Biography, National Centre of Biography, Australian National University, http://adb.anu.edu.au/biography/mcilwraith-sir-thomas-4099/text6549, published first in hardcopy 1974, accessed online 15 January 2019.